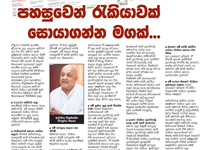 Dr. Wickrema Weerasooria was interviewed by "Tharunaya" ranked number one men´s magazine in Sri Lanka on the subject of topjobs and its recruitment process. Dr. Weerasooria explicated the online recruitment process and its highlighted advantages granted for both employers and job seekers. topjobs renewed services to National Gem & Jewellery Authority for a second consecutive year. National Gem & Jewellery Authority is coming under the purview of the Ministry of Enterprise Development and Investment Promotion. topjobs has enabled National Gem & Jewellery Authority to reduce job advertising costs as well as its recruitment cycle, which has ensured that urgent recruitment needs can be immediately addressed. topjobs has further provided National Gem & Jewellery Authority assistance with keying in all their vacancies, making the National Gem & Jewellery Authority’s HR team’s task easier. Dr. Wickrema Weerasooria was interviewed by one of the most popular radio broadcasting channels in Sri Lanka, Sri Lanka Broadcasting Corporation (SLBC). In this interview Dr. Weerasooria goes on to explain how topjobs has revolutionized the recruitment process by helping organizations cut costs and save time. An article was published about topjobs and it's innovative services in a leading women's magazine "Birinda". Author of this article Dr. Wickrema Weerasooria has discussed how topjobs has smoothen the recruitment process, creating a paperless environment for companies through internet by which companies will be able to cut down their advertising expenditure from a considerable amount. Dr. Sarath Amunugama the Minister for Enterprise Development & Investment Promotions took some time off from his busy schedule to look at the topjobs E-Recruitment system which celebrates its Second Year in operation this April. The topjobs Software System was outlined to Minister Amunugama by its developer, Mr. Senaka Weerasooria, the Managing Director of Genesiis Software PLC. 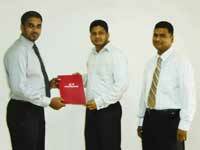 Over two hundred of Sri Lanka’s top companies now use topjobs for their Job recruitments and to fill their vacancies. Also, even when these companies advertise their vacancies in the newspapers the advertisement invariably states “online applications preferred on www topjobs with the name of the particular company after the name of the web-site. Free services for jobseekers allowing giving them better job prospects by choosing from the latest jobs in Sri Lanka from top companies, and then applying immediately with full confidentiality, security, and reliability. In 2007 we received US$ 750 Million in Foreign Direct Investment and we expect to reach US$ 1 Billion FDI in the near future. Investment in Sri Lanka must be supported by good infrastructure and services, and private sector participation in the provision of infrastructure and services is an important part of growth in Sri Lanka. In this context I commend the topjobs project by GENESIIS Software to provide an online and internet/web enabled employment and recruitment service that can be used to quickly find the necessary human resources for implementing investment projects in Sri Lanka. Companies that need skilled professionals in the fields of Information and Communication Technology (ICT) and Business Process Outsourcing (BPO) – to name two sectors - can use this system to find and recruit Sri Lankan talent. The topjobs systems gives excellent benefits to recruiters and employers, such as cost-effective online job advertising, one-click electronic short-listing, interview scheduling, a comprehensive database/job bank of human capital for urgent recruitment, and information sharing to enable a HR team to work together from different locations. For Jobseekers, topjobs is a free service that will let you apply immediately and confidentially to the latest job opportunities in Sri Lanka. I encourage all BOI companies to make use of this innovative and modern system to satisfy their recruitment needs. Sri Lanka places a significant emphasis on the use of IT for the provision of community services, and I hope that all companies in Sri Lanka will see the potential of this system to facilitate employment – not only in Colombo but also in the rural areas – where the youth of Sri Lanka can use the internet to find a better job. Finally, I am pleased to see Sri Lankan IT companies like GENESIIS developing their own software and intellectual property, exemplifying the creativity and entrepreneurship of Sri Lankan companies. 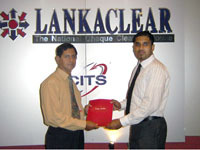 “TOPJOBS E-RECRUITMENT AN ASSET TO JOBSEEKERS” – SAYS PROFESSOR GL PEIRIS. 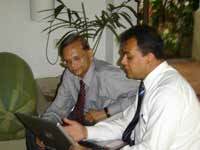 Hon Professor GL Peiris, Minister of Export Development and International Trade, who is one of Sri Lanka’s best known academics, being a Rhodes Scholar, and having functioned as Vice Chancellor of the University of Colombo and also as Dean of its Law Faculty recently had the opportunity to review the well known topjobs E-Recruitment System – www.topjobs.lk. Professor Peiris, who has chaired government commissions on issues relating to graduate employment was particularly interested in how Information Technology and the internet is being used to facilitate employment. Value for Money Job advertising on Sri Lanka’s #1 Job Site with 2 million jobs viewed per month and 20 million hits per month. E-recruitment with a range of services for an HR team – paperless online applications, automatic short-listing, interview scheduling, job bank of human capital for urgent recruitment. Free services for jobseekers giving them better job prospects and choice of the latest jobs in Sri Lanka from top companies. In year 2007 Sri Lanka recorded impressive export sales of US Dollars 7.7 billion. In 2008 we expect this figure to increase further, and the Balance of Payment should record a surplus for the fourth consecutive year, as it did in 2007. In particular, earnings from export of services such as transportation, Information Technology (IT) and IT Enabled Services (ITES) are making a noticeable contribution to the performance of the export sector. The value of earnings in 2007 from exports of software, IT Enabled Services such as Business Process Outsourcing (BPO), Knowledge Process Outsourcing (KPO) and other IT related services, is estimated to be US Dollars 110 Million. Relatively better IT infrastructure facilities, the availability of a skilled workforce, price competitiveness and reliable and efficient service delivery helped sustain the growth in this industry. Sri Lanka has a comparative advantage in promoting the BPO and KPO due to availability of qualified professionals in fields such as accountancy, law, and software development. We have the capacity to yield more benefits from BPO and KPO industries through specialisation and creating a more conducive environment for service oriented companies to operate. In this context I commend the www.topjobs.lk project by one of our Sri Lankan IT companies - GENESIIS Software - to provide an online and internet/web enabled employment and recruitment service that can be used to quickly find the necessary human resources for the value-added provision of services. Specifically, companies that need skilled professionals in the fields of Information and Communication Technology (ICT) and BPO and KPO will see tremendous value in using this system to find and recruit Sri Lankan talent. Inward worker remittances contribute significantly to the Balance of Payments, and I am pleased to see Foreign Employment Agencies are using topjobs to facilitate overseas employment for skilled Sri Lankan workers. In this respect, I hope that all companies in Sri Lanka will see the potential of topjobs to facilitate employment – not only in Colombo but also in the rural areas – where the youth of Sri Lanka can use the internet to find a better job – either overseas or in Sri Lanka. The well-known legal academic and former Public Official, Dr. Wickrema Weerasooria was one of those who helped to develop topjobs. Dr. Weerasooria told topjobs how Sir Arthur was one of those who had inspired the creation of topjobs. 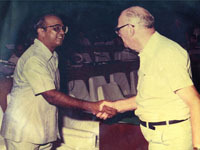 Dr. Weerasooria, was functioning as Secretary of Sri Lanka’s Ministry of Plan Implementation in the mid 1970’s. He knew Dr. Arthur C Clarke well. (see photo). On Dr. Weerasooria’s return from Monash University to Sri Lanka in 2002, he had met Dr. Arthur C Clarke who had convinced Dr. Weerasooria that Information Technology demanded an electronic system of Job Recruitment in Sri Lanka and Dr. Clarke had suggested a Software System like topjobs. It was from that meeting that topjobs was born. Sir Arthur’s well known words were “Don’t Commute, Communicate”. topjobs pays tribute to the name of the late Sir Arthur C Clarke who inspired this site. By extensively using topjobs, Pristine has realised significant savings in vacancy advertising by placing their vacancy requirements online. The entire Pristine HR team has ready and immediate to the topjobs recruitment database over the internet as topjobs is a ‘software on demand’ or ‘Software as a Service’ (SAAS) system. When an urgent staffing requirement arises - even on a weekend, or during out of office hours - Pristine can immediately place the vacancy on topjobs and receive applications immediately on the same day. The topjobs intelligent ranking system which automatically grades all applications based on parameters set by Pristine, means that the best candidates are identified for interviews without manual intervention – thereby saving time for the HR team. Informatics Group of Companies, founded in 1983 consists of 7 companies and has over 600 employees. It is a leading software solutions provider, with ISO 9001:2000 and SEI CMM – Level 4 accreditation, providing solutions for Telecom, Insurance, Banking, Government, E-business and the Retail industries. The company has strategic alliances and partnerships for IT solutions with Hewlett Packard HP, Fujitsu, Wincor Nixdorf, SGI, CISCO, Microsoft, Red Hat, Oracle, PCI, Parametric Technologies and Avid. Due to its diversified and expanding business activity, Informatics has regular and broad human capital requirements. To meet these recruitment demands, Informatics has been using the Topjobs recruitment system since June 2007, and has recently subscribed for its second year. Ms. Hashani Jinadasa, Business Development Executive, topjobs, said: “By using the topjobs internet recruitment model, Informatics has realised several benefits, resulting in time and costs savings in its recruitment activities. Firstly, the topjobs employer ‘back-office’ is user friendly and easy to use, resulting in reduction of vacancy publishing time, where vacancies are uploaded and visible within minutes. Secondly, Job applications are viewed immediately online eliminating printing and paper costs, and short-listing and candidate ranking is done with a click of a button. Thirdly, the recruitment process is streamlined as any member of the HR team can access the topjobs system from any location - even when overseas - and participate in the recruitment workflow, for example, by giving approvals or comments. The time-to-recruitment is made shorter, where - for example - some vacancies have received at least 50 applications the moment it is advertised on the topjobs website. Another benefit is the saving on advertising costs as the topjobs annual subscription cost is equivalent to a single large advertisement in the print media. Further, as the entire recruitment activity from advertising to hiring is automated and done electronically, the need for printing and handling paper has been largely eliminated”.